Not that long ago, I picked up a sweet kit from Papertrey Ink, the Make it Market: Holiday Hugs, but much too late to actually use it for winter or holiday cards. So you might ask, what is a girl to do? 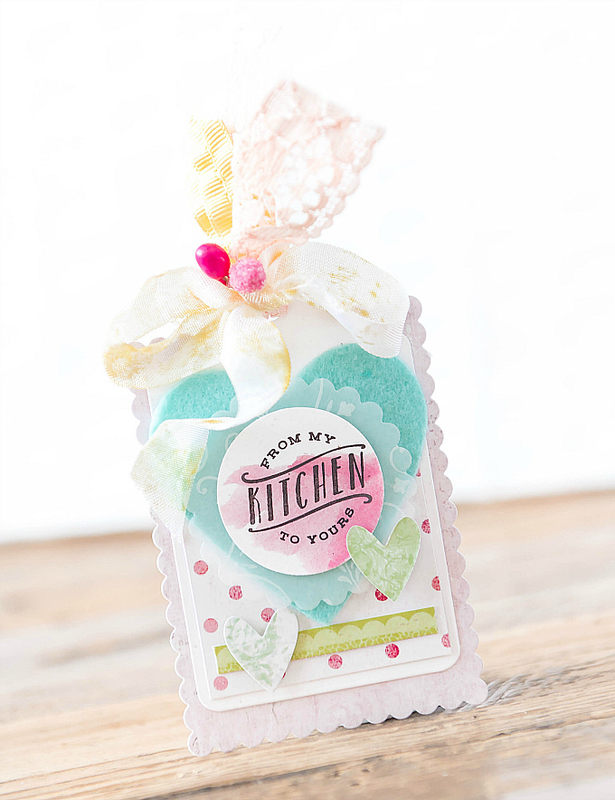 Today's trio features a more feminine, Spring-inspired twist on a really fun winter themed kit! If you look closely, you will see that the base used for this sweet little girl is the Tag Sale: Huggable die from PTI. And all the little pieces are from the Make it Market: Holiday Hugs set. I used the eyes and lips as is, and used Santa's joyful lips, as the cheek color. I decided to die-cut two of Santa's beard pieces, and turn them into her polka-dotted hair! To her hair, I added some floral embellishments, and I also stamped a few hearts along her bodice. Adding in a few floral strips and colorful bows, makes for a very Spring-y look, indeed. 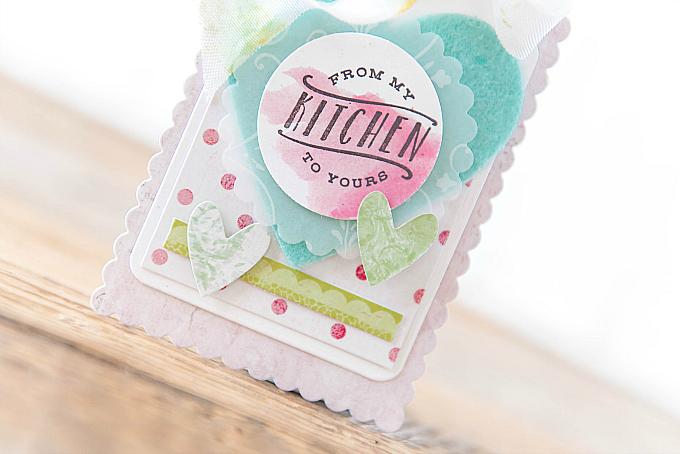 To finish this sweet tag, I added a mini tag cut using PTI's Tremendous Tags die, and stamped the sentiments using the Tag-Its #1 stamp set from Papertrey in colors of Aqua Mist, Raspberry Fizz, Green Parakeet, Mint Julep and Smokey Shadow. 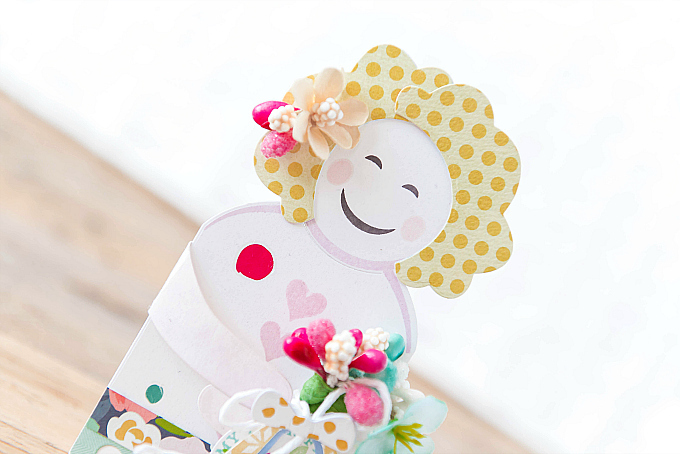 Next up, I created a matching tag, that can be layered with the Spring girl, or used alone. 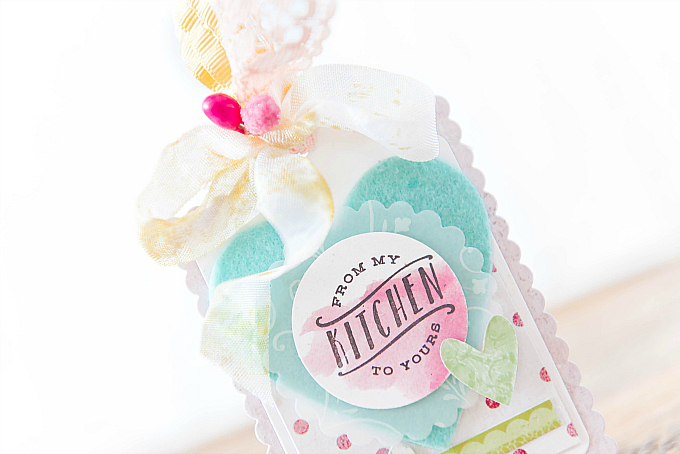 I just adore how little bits of vellum and polka dots give this tag such a playful vibe. To start the tag, I used the Monthly Moments Journal Card #2 die, and added a white Tag Sale #1 layer on top. For the top, I tied a couple of ribbons together, and embellished them with some bright berries. To the base, I also added polka dotted paper, an Aqua Mist felt heart, cut using Limitless Layers: Hearts. I added a bit of vellum and a few little hearts, cut using the Cover Plate: Hearts die. The watercolored sentiment is from an older wooden stamp in my stash. For my next card, I wanted to make one that could easily be personalized. I find that it's always helpful to have these on hand. You just never know when a new neighbor might move in, or if a housewarming party is around the corner. 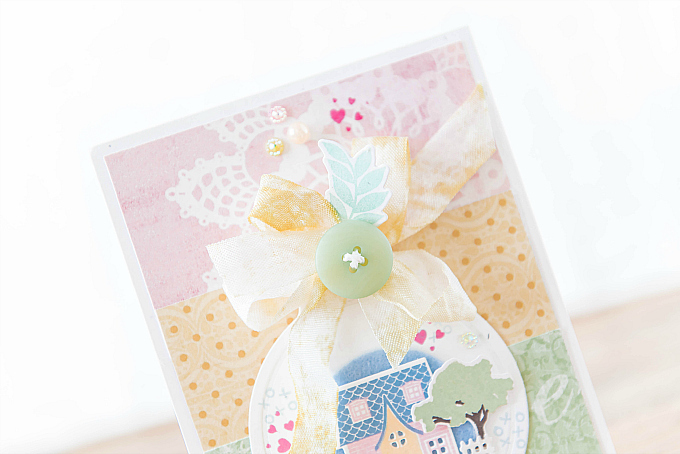 It's also super fun to play with these little houses from Papertrey's Petite Places: Home and Garden set. 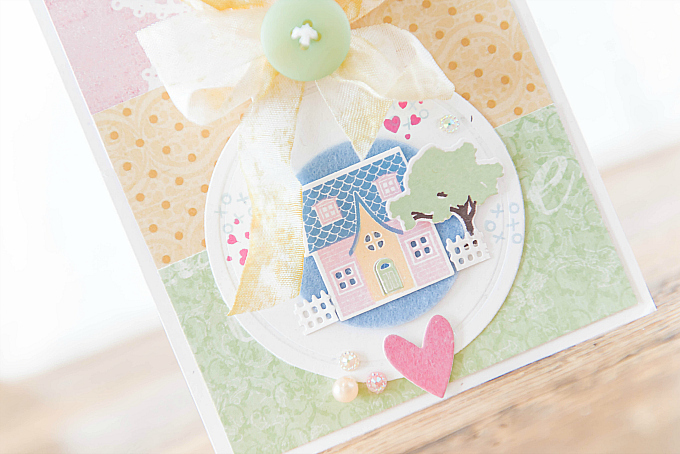 And now that the weather is warming up, I can't get enough of sweet, pastel hues, which look even better when paired with a cute house such as this! I layered three different patters on the base of this card, followed by a tag from Tag Sale #4. To the tag, I added a little scene, cut and stamped using PTI's Home and Garden stamps and dies, in colors of Harvest Gold, Pale Peony, Blueberry Sky, Mint Julep and Smokey Shadow. The wee hearts were stamped using Big Hugs stamps in Raspberry Fizz. To finish off the card, I added a ribbon, button, some rhinestones and a die-cut heart. Thank you so much for joining me and Happy Spring to you all! p.s. Friends - I'm trying out a NEW supplies list that will be featured at the end of each post. 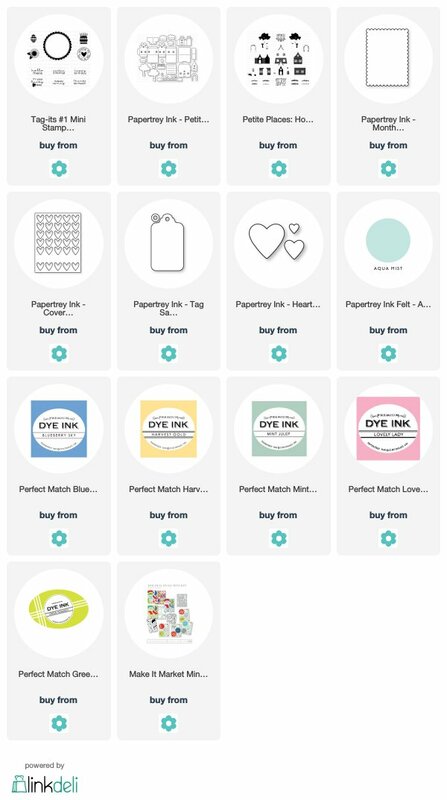 I hope it will make shopping a little easier and allow you to quickly see products I've used on each project. Using this feature will not add any additional costs to your purchase, but it will go a long way in helping me maintain this little blog of mine. Your purchases through any of the AMAZON or SCRAPBOOK.COM links below will help me convert a small portion of your sales towards running this little blog and creating new, exciting content on an on-going basis. So if you like what you see here and you enjoy visiting my creative space, please consider using these links when you shop. 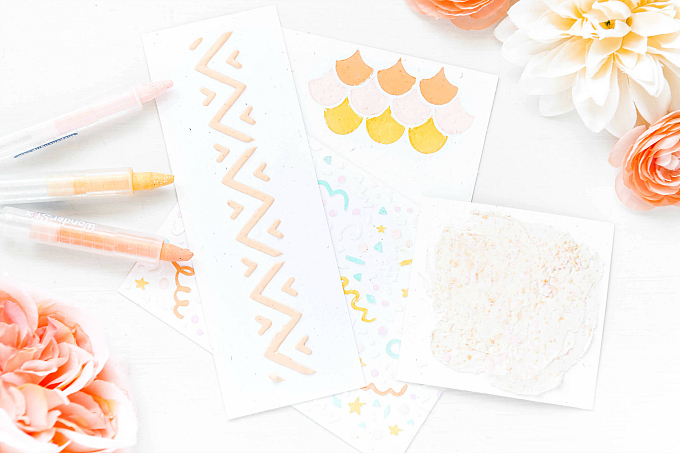 What a delightful and creative way to use this holiday kit! I always enjoy the soft lovely colors you use and all of the sweet little details you add. These are all wonderful Ivana! Such a unique way to use the huggable die. I love your use of color and texture. Your work is beautiful. 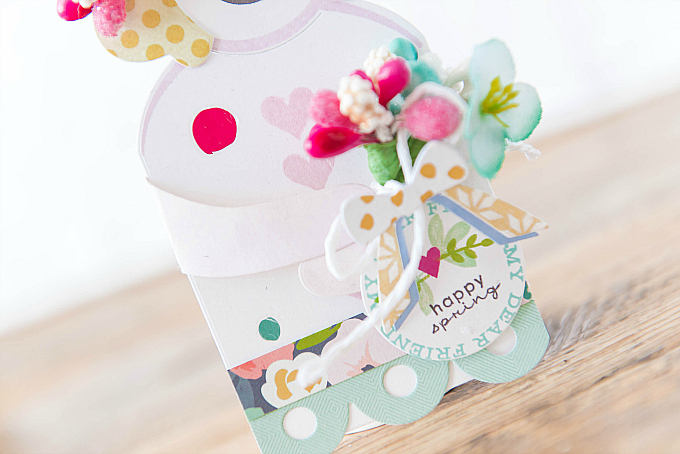 What adorable springy creations! Love! Hi Betty Sue! SO lovely to hear from you and see you here again :) Hope you are doing well! Thank you so much for the sweet note :) Sending hugs!